India is already known as one of the world’s IT powerhouses. 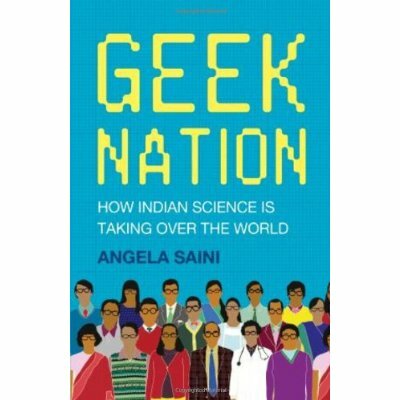 Angela Saini, author of the new book, Geek Nation: How Indian Science is Taking Over the World, believes the country is also becoming one of the world’s hubs for innovation and scientific ingenuity. Over the past few years, BRIC (Brazil-Russia-India-China) has become a buzzy acronym for technology- and finance-watchers. India is already known for call centers, IT development, and expatriate coders. The country is also home to one of the world’s fastest-growing middle classes. Angela Saini, the British author of the new Geek Nation: How Indian Science is Taking Over The World, believes that India is also becoming an innovation center to be reckoned with, and a world leader in tech. Fast Company recently spoke with Saini about India’s tech industry, the growth of Indian startups, and what the future holds for Indian innovators. Geek Nation is being released in the U.S. on May 1. FAST COMPANY: Why do you consider India to be a “Geek Nation”? ANGELA SAINI: I grew up in London, and it’s difficult to grow up in this city and not notice that every school has at least one geeky Indian kid. I was the geeky Indian kid in my class. My dad is a geek, many of my cousins are geeks, and more generally, India is famous for producing doctors, university professors, and engineers who work all over the world. India itself is not a world leader in science and technology yet but it does have a culture that strongly favors these things, above anything else. So Geek Nation was my journey to figure out why, and also where that ambition is taking it. I have to admit, as a science journalist, I started out with a big measure of skepticism–I mean, India has a weak scientific publication record compared to the U.S. and Europe–but the trajectory it’s on is just incredible. I think the rest of the world underestimates just what hundreds of thousands of committed young scientists and engineers can achieve. Then again, President Obama gets it. If you look at his speeches on science and education, he often mentions the growth of India as one reason that the U.S. needs to stay competitive. The subtitle of my book is a bit bombastic, but the contents are more balanced. I look at scientific research and technologies that are having a big effect on ordinary people’s lives–the good as well as the bad–and the ambitious projects that the government hopes will help secure India’s future superpower status. At the end of the day, I’m just a journalist. I’m not trying to argue a point, but rather to take an honest picture of a country through my geeky lens. What was the most surprising thing you uncovered while researching your book? There wasn’t a day in my research that I wasn’t surprised by something. I traveled the length of India, north to south, and met such fascinating characters. What impressed me most is that so many Indian researchers have such a social aspect to their work. They want to help India’s poor and vulnerable, as well as to do good science. One interviewee, Sujatha Narayanan, was a tuberculosis researcher I met in Chennai. A few years ago, when she didn’t have enough healthy volunteers for her work, she started running tests on herself. One day she found some TB bacteria in a tube that had been in her throat, which meant she may have accidentally infected herself. She had to undertake a grueling drug treatment for months, which she believes triggered her diabetes. She put her life on the line for her work, but it has not diminished her passion or her commitment to science. What role are ethnic Indian immigrants/returnees from the West playing in India’s tech industry? Are they a major factor? The success of India’s tech industry has encouraged a lot of young engineers and scientists who left the country, in the big brain drain, to return. And they’re playing a big part in shaping the future of the industry. Not only are they bringing their expertise and experience, but they are also bringing the culture of places like Silicon Valley. In Bangalore these days there are meetups and cool conferences for young techies and designers, just like you get in San Francisco. There’s this buzz about the big cities, which is making them an exciting environment to be in. But it’s not just in IT–I met scientists in all kinds of fields who had chosen to come back to India because they felt the opportunities were improving and that they could make a difference to the country. Can you explain why you compared India’s current situation to Japan in the early 1970s? When you read academic studies about the attitudes that people had toward Japan’s technology industry in its early days, it’s very similar to what people have been saying about India recently–that scientists and engineers are hardworking and educated, but not particularly creative or original. In Japan’s case of course that all changed, giving rise to a truly powerful scientific nation. I think similar stirrings are happening in India now. There are shoots of creativity all over the country, particularly in areas like biotechnology, life sciences, and computing. I don’t want to forecast what might happen, because I don’t think anyone can know for sure, but India does at least have the ambition and willpower to want to be the next scientific superpower. You wrote about jugaad–the power of improvising to solve problems–in a recent article. How do you think that has influenced India’s tech industry? I didn’t write about jugaad in my book. But yeah, I wrote an article about it recently, because it is such a fascinating phenomenon. Jugaad is a very broad-brush word, meaning something like getting things done by hook or by crook. So for example, in rural areas, people will throw together tractor engines and bits of wood to make trucks, and in the urban slums, people will recycle old newspapers and rework appliances to make new ones. It’s really driven by poverty, but it has inspired some Indian companies to look at frugal, mass innovation for India’s domestic market–for example, the TATA Nano car. But I don’t think it’s had a big impact on India’s mainstream technology industry, which is focused on creating high-quality products and services that can sell overseas. What do you see as the strong points and weak points of India’s tech industry? India’s tech industry is great at business innovation. India’s outsourcing model for IT work has been incredibly successful and, on the back of this, it’s managed to build a profitable industry that is globally competitive. But it’s less good at genuine technological innovation. India simply hasn’t yet produced a company of the caliber of IBM or Microsoft. But that isn’t to say it will never do it. It certainly wants to, but I have a feeling it may come from the younger generation, which is more free in its thinking and creative. This interview has been condensed and edited for length and readability. Geek Nation was released this past March in the United Kingdom and is currently awaiting U.S. release.